Aren't those CUTE?! They are two separate sets- the left purple/black background is set one and the right orange/yellow background is set two. 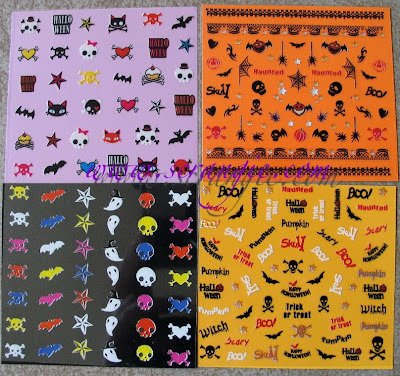 The left ones seem like a variation on my favorite Fing'rs EDGE decals with the skulls and bats (of which I may or may not have about 20 packages stockpiled...) and the ones on the right don't remind me of any existing set of decals. I adore these. There's only one thing I don't like about them. See how on the set on the right there are words? "Witch" "pumpkin" "skull" and whatnot? That's really lame. Boo is cute, Happy Halloween and Trick or Treat are cute, but honestly, how dumb is it to have the word 'skull' written on your nails? It's not a picture of a skull... It just says 'skull.' Uh.... Did they need page filler or something? Why not throw on a few more pictures of bats or actual skulls? The new Kiss ones are on the top left so you can see how they're packaged. Last year's Kiss ones (in the middle) were really cute. I don't know if you can see it but there's a pumpkin with a witch hat that's just adorable. There's also some bones in one set that look like dog bones that I've used with the Fing'rs paw print decals. 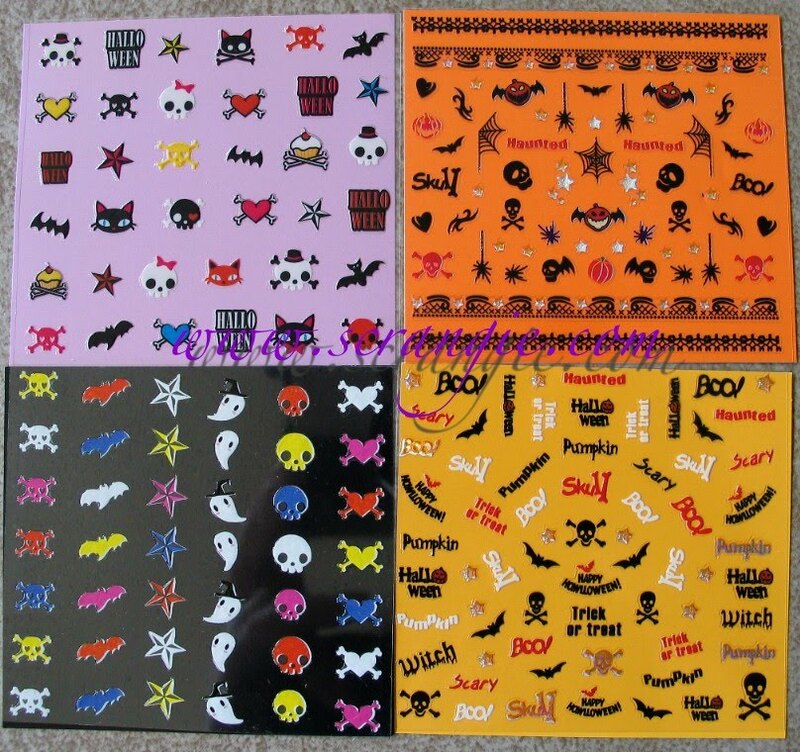 Are there any Halloween decals I'm missing? I need to collect them all! Haha, I laughed a lot at the paragraph about the wordy decals. That's exactly what I want on my nails. SKULL! Maybe for Christmas they'll go all out and make "Tree." Or "Giant Inflatable Snowglobe" for that matter. I think i saw them few days ago, it looks great! Those little ghosts are so cute! 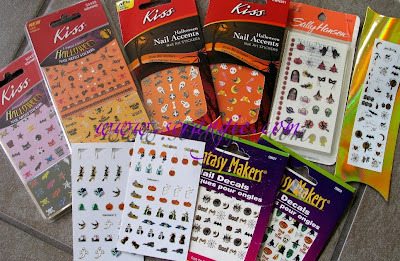 I love Halloween decals! These are too cute and I'm totally going to Walgreens to find these. Wow, that's a lot of decals! Very cute. Some may say your decal obsessed! Like them. The words are really stupid. Maybe if there were an actual skull there. I've only tried stickers on my nails. I'll have to look for these. I like the orange one! Seems like will be great for some fantastic and unique nail art! Sally's has a set out, too. I liked them a lot; you might want to check 'em out! I love how you talk about nail stuff like Pokemon. Gotta catch em all!